Exercise does a body good, right? Well, most of the time it does. Other times, it can be a little dangerous. Before you hit the gym, water, track or trails, it’s important to know the impact your form of exercise will have on your body. The last thing you want to do is injure yourself and not be able to exercise at all. Here are 17 exercises you’re better off not doing, plus several suggestions for what you can do instead to prevent injury. Once a popular exercise, the behind-the-head lat pull-down is a bad idea, says certified trainer Dean Anderson. The issue with this exercise is pulling the bar behind your neck puts excess stress on your shoulder joint; the outward rotation of the humerus (funny bone) combined with the downward pulling motion hurts the shoulder joint, Dr. Michele Olson, an NSCA-certified strength and conditioning specialist. Tendons and ligaments can get overstretched, which can lead to an injury, tells Anderson. To work your lats more carefully, pull the bar down in front of you instead. Sit up straight with your abdominal muscles pulled in tight. Bring the bar down toward your chest, but keep it above your collarbone. Despite instructions from Barre and sculpting class teachers, doing arm circles with three- and five-pound weights can lead to shoulder pain down the road, according Shape’s Jessica Matthews. How your arms are positioned, the force that comes from the hand weights and pulling your joints against gravity leaves the shoulder unstable and vulnerable. A more shoulder-friendly alternative is a dumbbell lateral raise. Lifting and lowering your arms against gravity at that angle will put less tension on the shoulder joint. The upright barbell row is one of the most harmful exercises for your shoulders, according to Nick Nilsson at bodybuilding.com. The danger comes from how you have to position your arms when you do this exercise: with internal rotation. When you lift your arms and add resistance in that position, a tendon in the shoulder gets pinched. It won’t hurt right away or maybe even for a while, but the tendon will eventually give out. Do dumbbell, military presses and front dumbbell raises instead. This exercise can be dangerous because it’s tough to maintain the required position; arms by your sides, palms facing forward. If you slip out of this position, your shoulders quickly become vulnerable to injuries like abrasions to the rotator cuff and deltoid, certified personal trainer Lee Boyce writes. A strong core can help make any other exercises you do easier, but sit-ups and crunches aren’t the best way to obtain one, according to exercise physiologist Heather Milton. They’re not that effective, and they put a lot of stress on your spinal column and lower back. Sit-ups actually mimic the force in the spine that can create disc bulges and herniation — plus, they only engage one portion of the abdominal muscle anyway. The plank works the abs better and isn’t as harsh on the back. If you prefer to do crunches, you can limit the amount of pressure you are putting on back by simply holding the crunch. The kipping pull-up is a popular exercise in the CrossFit community, but it’s not necessarily the safest way to work your upper body, says Sam Becker. When you whip your body on the bar, you put a lot of stress on your muscles and tendons. A less risky alternative is to do standard dead-hang pull-ups. It’s important to work out the lower half of your body, too, but not at the expense of your lower back and knee joints. Unfortunately, those are two of the areas that suffer the most aggravation when you use the leg curl machine. The leg extension machine is also problematic: It can bother existing knee issues, according to metabolic training expert Nate Trenteseaux. A Smith machine is used for weight training; it has barbell that’s fixed within steel rails, and you move can the barbell vertically. Diet Blog’s Mike Howard advises you avoid this piece of equipment, as it doesn’t allow any room for the lifter to make mechanical adjustments because it’s fixed to that rail. Plus, it can be tough on lifters’ knees and lower backs if they want to use it for squats. A safer bet is any barbell and dumbbell alternative. Avoid any exercise that would force knee flexion, as it can put too much pressure on the kneecap or any of the bones surrounding the joint. Extra pressure on the knees can result in grinding of the joints and the kneecap, which can then lead to tendon and knee ligament damage. Some exercises that require knee flexion include hurdler’s stretches, deep squats, lunges and full arc knee bends. The amount of weight used while doing this exercise (moving the dumbbell or barbell from out in front of you back towards your collarbone) isn’t necessarily what can cause an injury, but the motion, writes Ryan Wagner. Repeating the upright row motion too often can lead to shoulder impingement or rotator cuff damage. Instead, do lateral dumbbell raises. From a standing position, lift with a dumbbell in each hand and raise them out to your sides until they’re level with your shoulders. When you have to rotate your shoulders to lift a barbell behind your neck, your shoulder joint gets tweaked. Additionally, your rotator cuff and shoulder are loaded with weight that’s just adding more pressure to a joint already in a bad position, says exercise <href=”#slide=3″ >physiologist Irv Rubenstein. Go easier on your joints by using a bar or dumbbells in front of your body, and push off from your collarbone area. The kettlebell is great for strength training, so it doesn’t necessarily have to be avoided at all costs, but using it properly is paramount, says Dr. Joseph Mercola. That means not swinging or lifting a kettlebell with your arms, but rather your lower body — your glutes and hamstrings in particular. If you try to just use your arms to move a kettlebell, you run the risk of damaging your rotator cuff or suffering other shoulder injuries. Rows are a great exercise for your shoulder and back, but shouldn’t be performed with you bent at the waist, says Jessica Malpelli, DPT. Being in that position leaves your back open to a displaced disc that could potentially hit a never. When you do rows from your waist, you can cause your shoulders to roll forward, which can lead to poor posture. Save your back and do rows lying face down on a bench or a Swiss exercise ball. Box jump are another popular exercise that makes for a great workout, but only when done properly to avoid a knee injury. 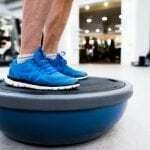 The high-intensity nature of this exercise, combined with the constant jumping up on a platform and back down to the floor, is a recipe for stress and strain on the body, especially the knees, according to the University of Pittsburgh Medical Center sports medicine team. For any exercise that requires jumping, proper form will protect your joints. When you land, stay loose and keep your knees bent to absorb the impact. Trainer Keli Roberts recommends avoiding this exercise at all costs simply due to the sheer force it can put on your knees and the fact that it could lead to an injury. A safer way to get your quads stronger and more flexible is by doing yoga. Exercises like this one force your deep hip flexors to do a major of the work, which puts a lot of stress on your lower back. Alternate exercises include planks, straight leg lowers and bicycle crunches. The straight leg lowers are probably the easiest to do: Just lie on your back with your abs engaged, and keep your hands by your sides or underneath your lower back for support. Your back shouldn’t arch during the exercise. These machines are often occupied at the gym, but that doesn’t mean they are good for you. When you use your inner or outer thighs to move weight while you are sitting down, you could strain lower back muscles or aggravate any existing hip problems. Your inner and outer thighs are meant to support movement, not be primary movers as they are on that machine. These machines are pretty popular in most gyms. Both involve sitting with your knees bent in front of you. The adduction machine is designed to target the muscles of the inner thighs, and the abduction machine helps target the outer thigh muscles. Safer ways to work those muscles are standing or lying abduction exercises, or Pilates.